Buy great quality foods for your furry, and not so furry, little friends. 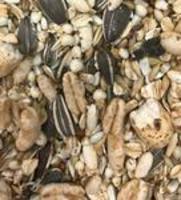 May contain the following ingredients: Rolled oats, milo, sunflower seeds, safflower seeds, oats groats, white millet, red millet, barley, flax, puffed rice, puffed millet and puffed wheat. Please note: This is to be used as a treat or extra, in addition to a nutritous rodent block staple diet for rats, hamsters, and mice. IMPORTANT: WE SHIP EVERY SATURDAY AND WEDNESDAY ONLY, PLEASE PLAN ACCORDINGLY. 1, 2, 3 lbs: $8.00 No charge for shipping if you pick up grain mix at our store or at one of our events in San Diego (see our Events Schedule). Please email us ahead of time if you would like to pick up an event. We proudly carry Envigo Teklad food blocks for rats, mice, and hamsters. We stock 8640, 2014, 2016, 2018 and 8604 rodent blocks. Price: $1.25 per pound of food. No charge for shipping if you pick up food at our store or at one of our events in San Diego (see our Events Schedule). Please email us ahead of time if you would like to pickup at one of our events. and reproduction of rodents. Typical isoflavone concentrations (daidzein + genistein aglycone equivalents) range from 350 to 650 mg/kg. Wheat middlings, ground wheat, ground corn, corn gluten meal, calcium carbonate, soybean oil, dicalcium phosphate, iodized salt, L-lysine, vitamin E acetate, DL-methionine, magnesium oxide, choline chloride, manganous oxide, ferrous sulfate, menadione sodium bisulfite complex (source of vitamin K activity), zinc oxide, copper sulfate, niacin, calcium pantothenate, calcium iodate, pyridoxine hydrochloride, riboflavin, thiamin mononitrate, vitamin A acetate, vitamin B12 supplement, folic acid, cobalt carbonate, biotin, vitamin D3 supplement. 2016 is a fixed formula, non-autoclavable diet manufactured with high quality ingredients and designed to support growth and maintenance. 016 does not contain alfalfa or soybean meal, thus minimizing the occurrence of natural phytoestrogens. Ground wheat, ground corn, wheat middlings, corn gluten meal, calcium carbonate, dicalcium phosphate, soybean oil, brewers dried yeast, iodized salt, L-lysine, DL-methionine, choline chloride, magnesium oxide, vitamin E acetate, menadione sodium bisulfite complex (source of vitamin K activity), manganous oxide, ferrous sulfate, zinc oxide, niacin, calcium pantothenate, copper sulfate, pyridoxine hydrochloride, riboflavin, thiamin mononitrate, vitamin A acetate, calcium iodate, vitamin B12 supplement, folic acid, biotin, vitamin D3 supplement, cobalt carbonate. 8604 is a fixed formula, non-autoclavable diet manufactured with high quality ingredients and designed to support gestation, lactation, and growth of rodents. Dehulled soybean meal, wheat middlings, flaked corn, ground corn, fish meal, cane molasses, ground wheat, dried whey, soybean oil, brewers dried yeast, dicalcium phosphate, calcium carbonate, iodized salt, choline chloride, kaolin, magnesium oxide, ferrous sulfate, vitamin E acetate, menadione sodium bisulfite complex (source of vitamin K activity), manganous oxide, copper sulfate, zinc oxide, niacin, thiamin mononitrate, vitamin A acetate, vitamin D3 supplement, calcium pantothenate, pyridoxine hydrochloride, riboflavin, vitamin B12 supplement, calcium iodate, folic acid, biotin, cobalt carbonate.